Tyson Etienne 6'1 G 2019 a Shocker! Wichita State has offered 6'1 point guard Tyson Etienne from Englewood, New Jersey. Ranked #131 in his class by Rivals and #149 by 247. Other offers from Cincinnati, Oklahoma, Auburn, St. John's, Ole Miss, VCU, Seton Hall, Maryland, Illinois, and Dayton. 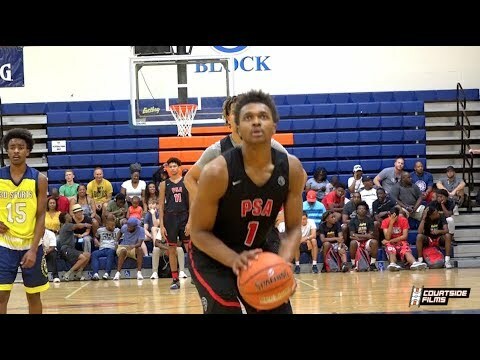 Played for PSA Cardinals on the Nike EYBL circuit, averaging 8.6 points and 1.3 assists per game. For having possibly as few as 1 spot available, we sure seem to be doing a "rapid fire" of offers lately. Perhaps it's time to update this. I suppose one can't have enough lines in the water. And one never knows how many of the current crop will stick around for next season. I'd sure like to see us get one of the top PGs available for 2019 though. Gregg and full staff will do an in-home with Tyson tomorrow. Trying to snag an official visit I would assume. Several big-name schools in the mix. Just debuted at #124 on Rivals150. Tyson will take an official visit to WSU next weekend. #123 in the 2019 class on Rivals. It’s great to have elite players interested in the Shockers. Gregg visited Tyson yesterday at Putnam Science Academy in Connecticut. Tyson is schedule to take an official visit to WSU this weekend. Gregg hitting the NE hard ... gotta assuming that playing games @UCONN, @Temple help with the pitch. Yes he can. He can play either guard, pushes the ball, has speed to burn, makes plays, can shoot it, is obviously tough, and looks like a "winner" to me. Crystal ball for WSU on Friday. Probably only related to him taking an OV this weekend but doesn't hurt. OU just landed their fifth commitment in the 2019 class, so they may be done for the fall. Tyson has taken an official to OU and an unofficial to VCU recently. Could be more visits to come but nothing confirmed at this point. How many available scholarships does OU have? Never mind, I looked at their roster, it looks like they have 5 guys leaving after this year. If they recruit like WSU, they still have a couple scholarships to offer. It's a safe bet that Marshall isn't the only guy who has figured out you can't get to 13 -- or what seems potentially to be 13 -- and then sit back and relax. Lon Kruger has been around the block, actually around a number of blocks (he even stopped somewhere along the way and got rid of that youthful unibrow). So he won't coast prematurely on Etienne or anyone else. I like ! Would either start or at the very least play significant minutes as a freshman.